Support for the use of medical marijuana to treat a variety of health conditions is quickly gaining traction in the U.S. Today, clinicians prescribe marijuana to address a range of ailments, including cancer, glaucoma, and chronic pain. According to the Drug Policy Alliance, there is strong bipartisan support for medical marijuana use, with more than 70% of voters in favor of the right to use medical marijuana if recommended by a doctor. Today, both the use and production of medical marijuana are legal in 23 states and the District of Columbia. The medical marijuana movement and the push to legalize marijuana for recreational use are expected to expand. The mainstreaming of marijuana poses a dilemma for employers, who may be unsure whether and how to accommodate marijuana users in the workplace. These tips can help companies set the right policies. Responding to employee inquiries about medical marijuana use. When employees ask whether they are allowed to use doctor-prescribed marijuana, some employers may be tempted to respond with a put-down, such as, “Stoners don’t come into work." That’s the wrong answer. Instead, ask the employee to describe any accommodations he or she may require. It’s important to respect the employee’s right to privacy in discussions that touch on medical issues. Employers, however, have a legitimate interest in ensuring that any medications the employee takes are used in a responsible manner and will not affect job performance. Accommodating employee use of medical marijuana. Some employees may rely on medications, including medical marijuana, to enable them to tolerate pain and function at the highest levels. In these cases, it is reasonable for employers to insist on discreet usage and the avoidance of marijuana plant flowers. State laws may dictate whether employers should allow use under these conditions or uphold a zero-tolerance policy. 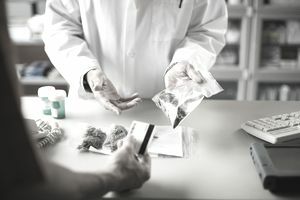 Some states require accommodation for medical marijuana use, whereas others, like Colorado, explicitly state that employers do not have any excuses to tolerate medical marijuana use in the workplace. Often, it comes down to a judgment call by a responsible employee and considerate employer. Setting workplace policies for recreational marijuana use. Some states, including Colorado, Washington, Alaska, and Oregon, allow citizens to use marijuana for recreational purposes. That means employers in these states should revise the wording of their drug policies. It may be helpful to model the company’s recreational marijuana policy after the existing policies on alcohol use, i.e., it is allowed on the employee’s own time but coming into work under the influence is prohibited. In general, it’s a good idea to prohibit employees from smoking marijuana at the office or to come to the workplace under the influence of any psychoactive substance. Employers should spell out the consequences of using marijuana during working hours in states where recreational use is permitted. Banning marijuana use completely. Some employers mistakenly believe the simplest policy is to prohibit marijuana use completely, even in states where it is legal. This can be a problem from an employee-relations standpoint as well as from an enforcement perspective. Instead, employers should focus on regulating on-the-clock behavior; this approach respects employee privacy and is more enforceable. In industries that require employees to operate heavy machinery or where other safety concerns are relevant, working under the influence of marijuana should be strictly prohibited, just as on-the-job alcohol use is. Companies can also alter drug screening guidelines to exclude cannabis during routine drug tests. Setting marijuana policy for lunch and breaks. Most employers want to respect employee privacy on breaks and at lunchtime. That being said, employers do have a vested interest in ensuring that employees return from breaks on time and ready to resume productive activities. Employers can and should demand that employees operate at full capacity and not under the influence of psychoactive substances throughout the workday. In setting lunch and break time policy for marijuana, employers may find it helpful to follow the existing policy for alcohol. Medical marijuana will continue to gain legal recognition in more states and recreational use of marijuana will become more mainstream. It’s a good idea for employers to revise their policies to address the issue. Striking the right balance between respecting employee privacy and ensuring peak productivity may seem challenging at first. However, the issues involved in addressing marijuana use in the workplace are similar to issues employers have long encountered regarding alcohol use. Employers should educate themselves on the laws in effect in their state. Approach employee requests for accommodation in a compassionate, respectful manner. By following these tips, employers can outline clear policies and ensure that their organization is ready to keep up with evolving marijuana laws.